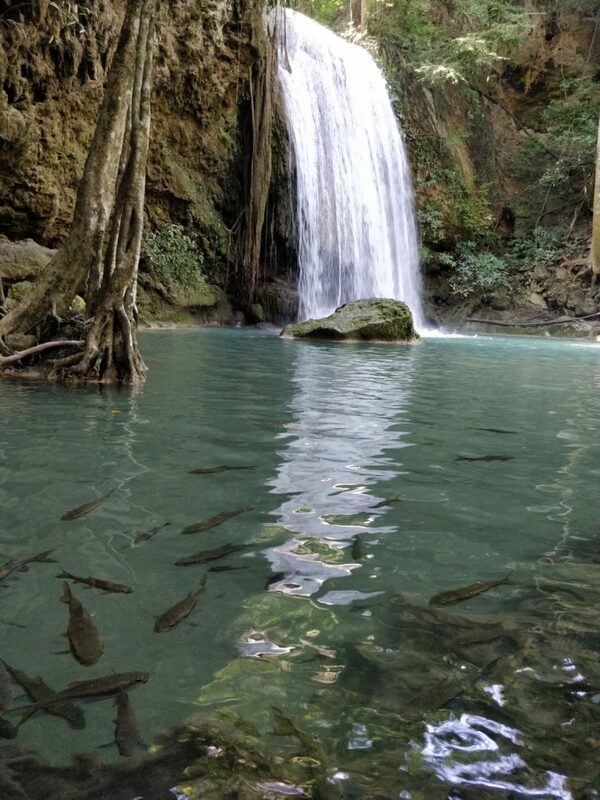 Erawan waterfall is named as the most beautiful waterfall in Thailand. 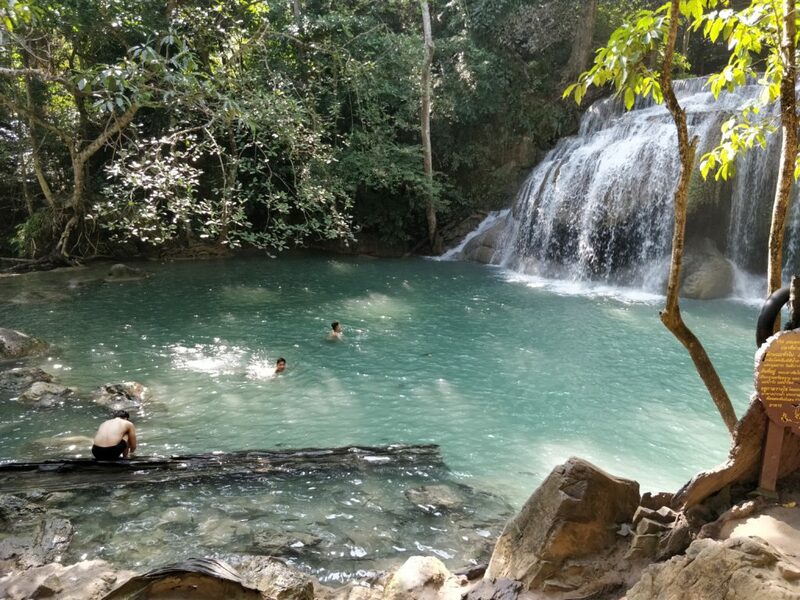 It locates in Kanchanaburi province not too far from Bangkok (The capital of Thailand). 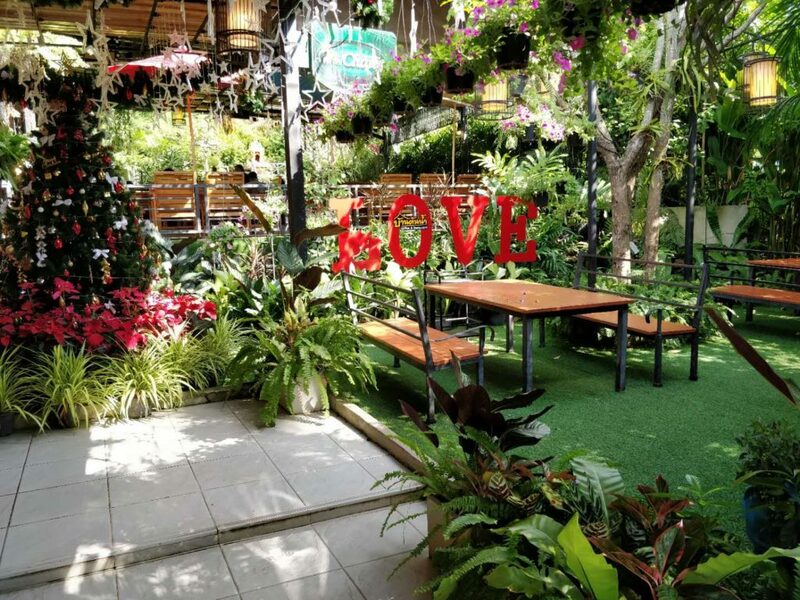 If you want some natural scenery and landscape tour to fit your itinerary in Bangkok. 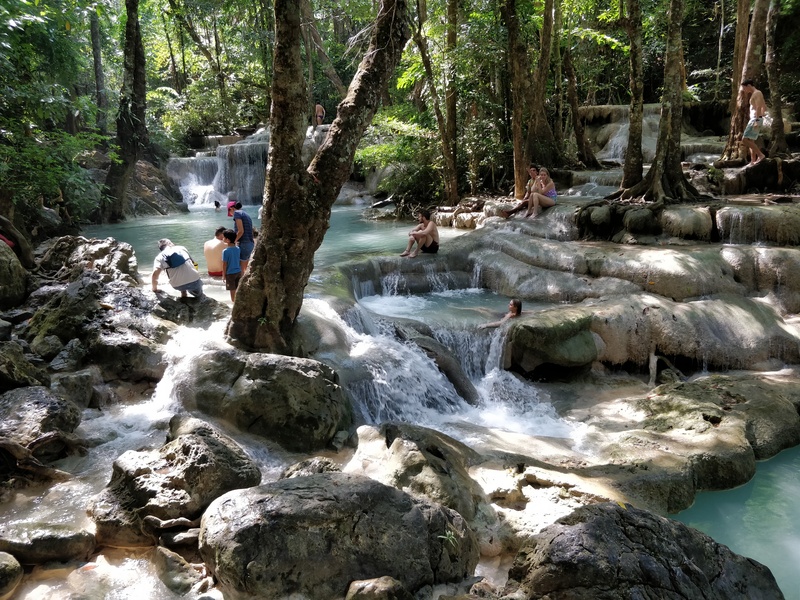 Erawan waterfall is the best choice for you to spend a day. 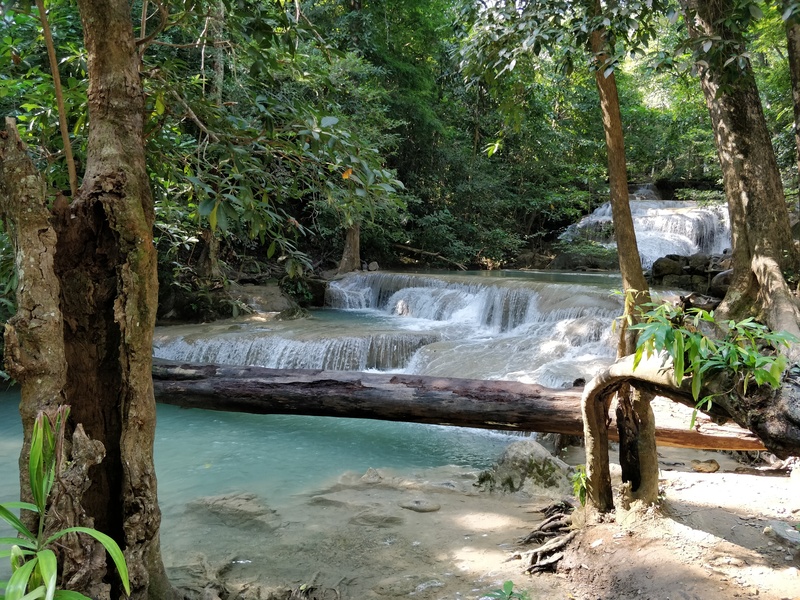 Erawan waterfall is about 200km northwest away from Bangkok. There is no direct public transportation to the waterfall, you may either rent a car or follow local tour. 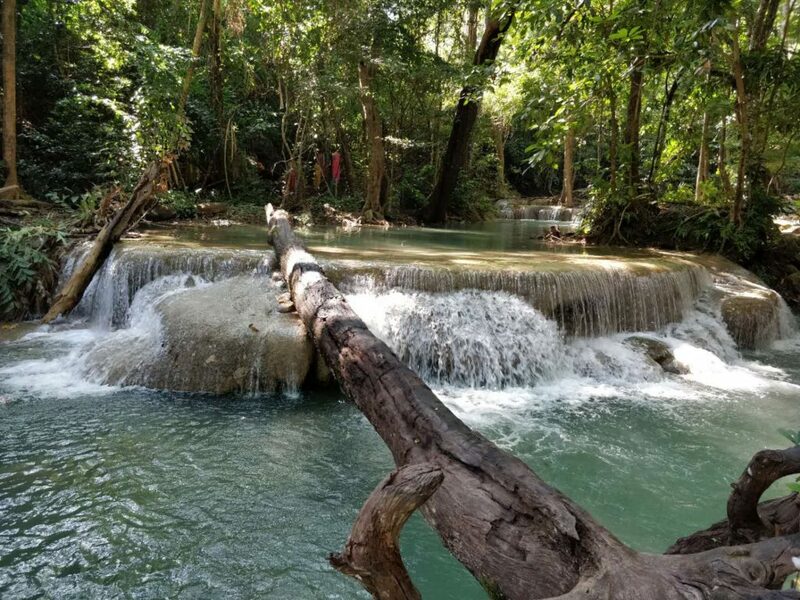 The Erawan waterfall one day local tour price is around 1500Baht (USD45) which includes round trip transportation cost, lunch and park entrance fee, the tour will pick you up at your hotel in the early morning and drop you down at the designated place after the trip. My girlfriend and I have experience driving in Thailand. So we decided to drive there by ourselves, the one way journey took me around 3 hours. It is pretty easy. 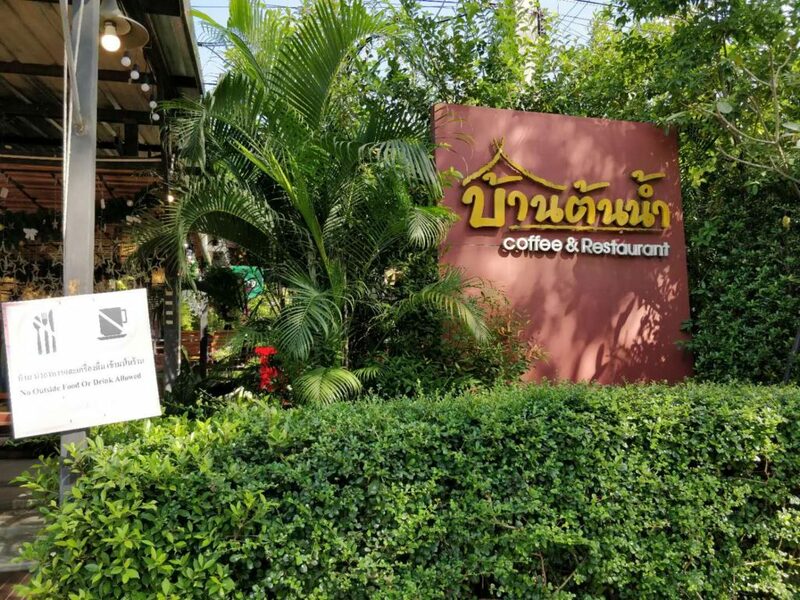 After you paid for the entrance fee (200 Baht per permit for foreigner) of the national park, you will see the touring golf cars not far from the parking lot, there are restaurants, shops where you can stop by for the swimming suits. 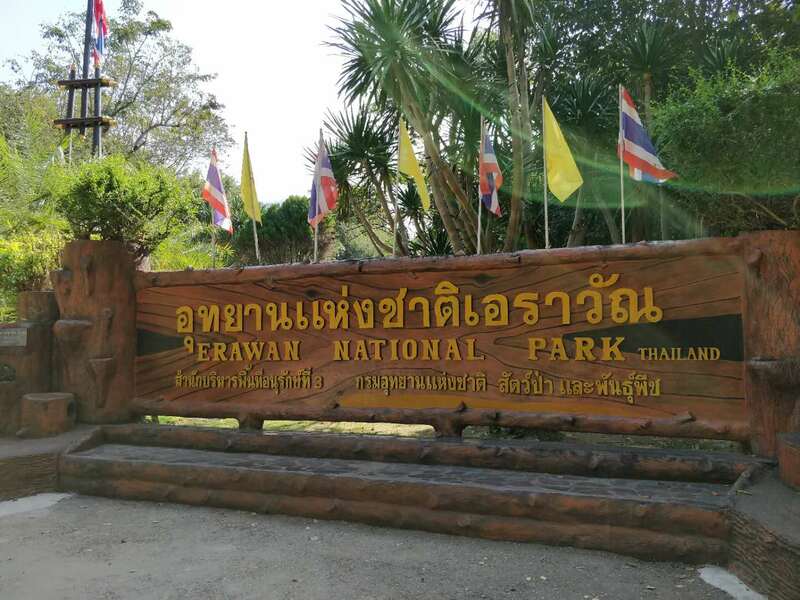 You can pay 30Baht per person for a one way ride on the golf car directly to the entrance of the hiking trial (There is only one trial open for hiking, therefore it is pretty easy to follow). 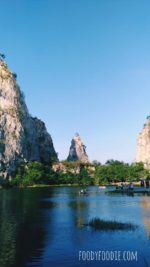 The hiking trail is summed up with 7 tiers where you can going from bottom to the top, as I read the introduction of the trail, it is categorized as beginner level and suitable for kids. But I feel like the difficulty is getting a lot tougher after tier 5 (Level 5), where you may expect to strode across the water, slippery stones, climb between rocks and steep stairs. The water is getting so blue and clear when you are hiking up along the trial. You can see people chilling and swimming with the fishes. It took like like 2 hours to hike up the entire trial and 45 minutes to get back down to the starting point. It was enjoyable tho and all views are captivating. 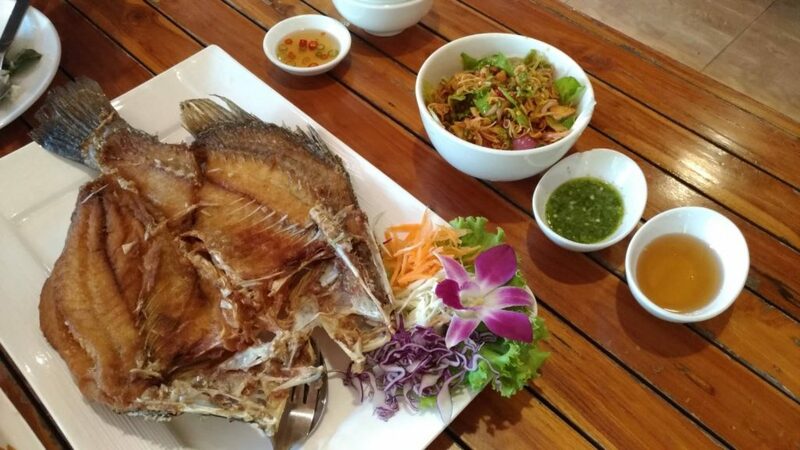 After hiking for few hours, our stomachs were so ready for late lunch, we look for restaurant through Wongnai App, Wongnai is the top website in Thailand where people share restaurants recommendations and food reviews. You can easily find local delicacy even you are in the middle of nowhere. We found Bann Ton Nam coffee & Restaurant on Wongnai with pretty decent review. 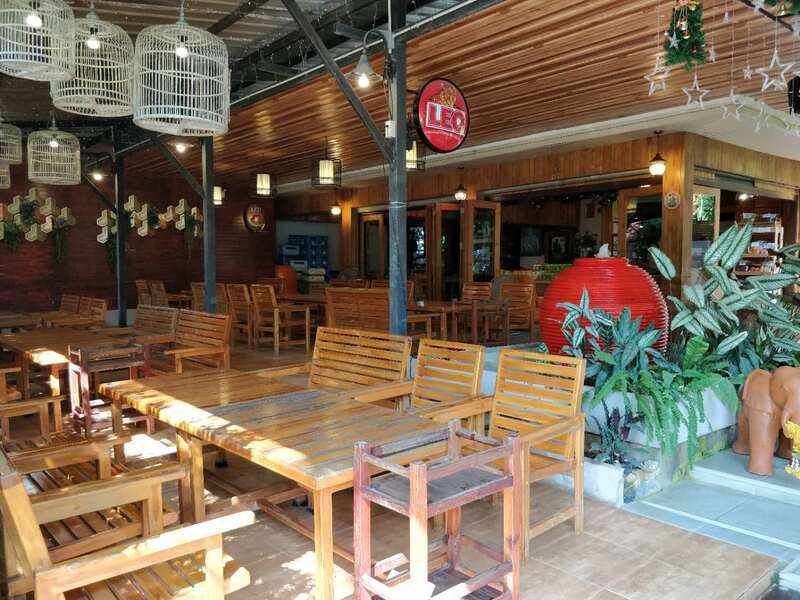 The environment is very nice and have parking area outside the restaurant. Maybe we came here late at 3 p.m, there were not many people. Mm, the food looks delicious, firstly. The waterfall is so beautiful – would love to visit here so much! 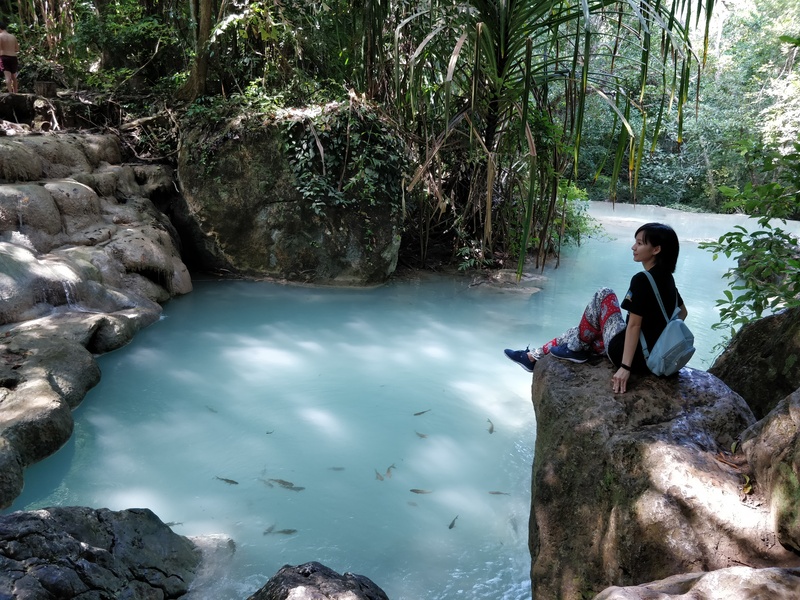 A visit in Erawan waterfall seems very exciting. Looking forward to the experience. Such a peaceful and beautiful place. I cant stop looking at and admiring the photos. Seafood and a waterfall sound amazing to me. I would love to swim in this water and eat plenty of shrimp. The waterfall looks absolutely fantastic! So so beautiful! And perfect for a swim! the food looks amazing too! The waterfall looks so pretty, definitely worth the 2 hours hike. It’s awesome that you can swim with the fish at the bottom. I think it’s a very refreshing way to end the hike. Beautiful place I would like to visit some day. 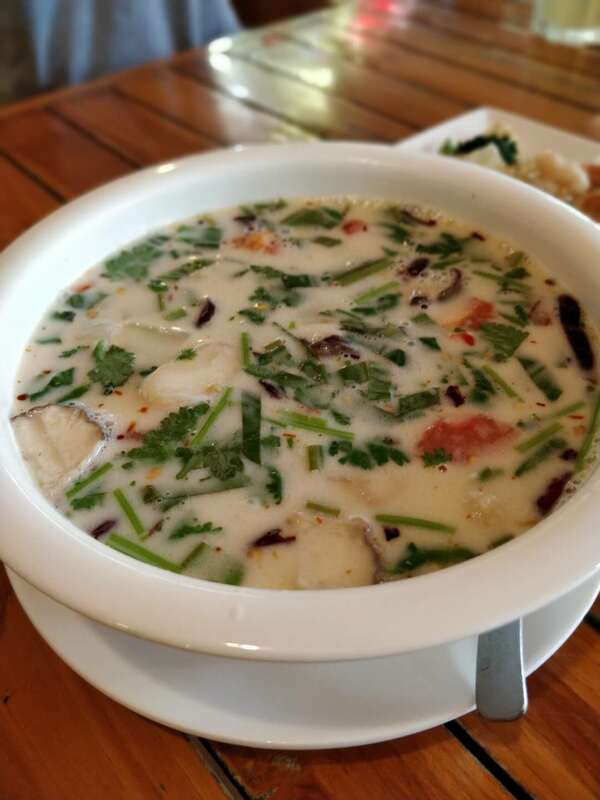 Love the food, especially the shrimp and spicy coconut chicken soup. Wow what a trek to get to the waterfall. But I definitely think it’s worth it with that gorgeous view, just stunning! 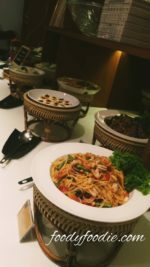 Authentic and delicious food after a swim is just perfect for holidaying. 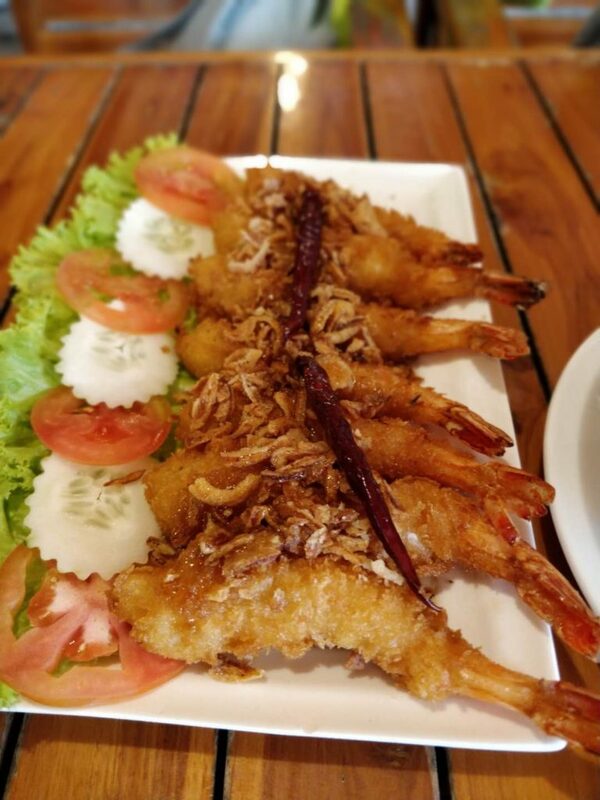 Deep fried shrimps is my favourite, never had coconut chicken soup before, would love to try. Omg! It has always been my dream to visit the beautiful country of Thailand. A country known for having a beautiful culture. Your travel photos are amazing! What a neat place to visit. The water looks so pretty there – I love the color but that you can also see into the water. And the dining looks nice too. Oh wow your pictures are amazing! I went to Bangkok but it was at the end of my Thailand trip so we wouldn’t have had time to get here. I wish I had known about it before though. Thank you for sharing this! If I ever get back there hopefully I can go!